If you are looking for an exciting holiday destination, look no further than Wellington, New Zealand. It has everything you could look for in a city break holiday–history, museums, great restaurants, shopping, nightlife, and incredible natural beauty. The Wellington CBD is located on the large Wellington Harbour, and throughout the city, you can see the hills and mountains in the distance. No matter where you are in Wellington, you’ll never feel like you’re that far from nature. Because of everything that it has to offer, Wellington has been referred to as the world’s ‘coolest little capital.’ When you visit Wellington, you are also within easy access to some of the other top destinations in New Zealand, including the Marlborough wine region and the scenic Interislander ferry. Between flights and accommodation, planning a trip to Wellington can get expensive. Save money on your holiday planning with Wellington accommodation and flight packages. These packages bundle together your hotel and flight expenses, saving you up to several hundred dollars on your holiday. Webjet’s Wellington packages also offer convenience. There’s no need to spend hours trawling the internet for the best deals. 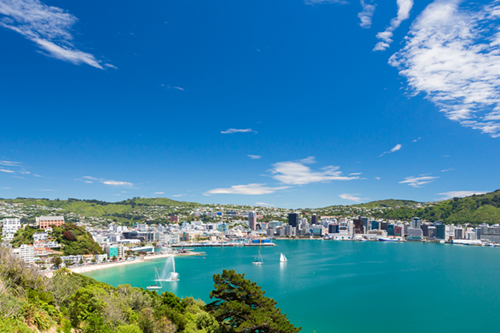 Webjet will take care of that so you can focus on planning the activities you want to experience in Wellington. Wellington holiday packages are a great option for families who want to save money on their trip to the New Zealand capital. Wellington is home to one airport, which is located 8 kilometres (5 miles) southeast of the city. Wellington Airport (WLG) receives a large number of flights from Australia each day. Once you’ve touched down in New Zealand, there is an Airport Flyer bus that will take you to the city centre in less than a half hour. Airlines offering flights between Australia and Wellington include Virgin Australia, Qantas, Jetstar, Air New Zealand, and Emirates. If you are flying from Melbourne, Sydney, Brisbane, or the Gold Coast, there are direct flights into Wellington available. You will arrive to Wellington in about 3 and a half hours from each of these cities. Coming from another airport in Australia, you can book a flight to Wellington with a short stopover. Throughout Wellington, there are lots of great hotels to choose from. Many hotels in Wellington offer a modern and sleek design and are within easy walking distance of the top CBD attractions. The Grand Mercure is located on one of Wellington’s many hills and offers expansive views over the city. The hotel has a contemporary design with touches of luxury. There are six room sizes available, many of which have a view over the city. Amenities within the Grand Mercure include a restaurant, indoor pool, and fitness centre. From the hotel, you are a 5-minute walk into the hustle and bustle of the Wellington CBD where you’ll have access to endless restaurants, cafes, bars, and shops. The U Residence Hotel offers serviced apartments minutes away from the harbour and the exciting Cuba Street. Apartments range in size from studios to 2-bedrooms and include a kitchen and balcony. Apartments have a trendy but comfortable design that will have you feeling right at home in Wellington. While staying at the U Residence Hotel, guests receive free WiFi and have access to the building’s fitness centre. This hotel is an example of modern luxury in central Wellington. Directly across from Te Papa and steps away from the bustling Courtenay Place, the QT is perfectly located. The hotel has an artistic flair complete with a curated collection of paintings and sculptures throughout the building. Rooms have a contemporary design, and many offer views of the harbour. Within the hotel, you have access to two restaurants as well as a pool, gym, and spa. Staying at the QT will guarantee a great stay in Wellington. For a small city, Wellington has a big personality. It is the capital city of New Zealand and has an exciting culture to experience. In addition to the many tourist attractions throughout the city, Wellington is known for its great restaurants, cafes, and craft beer bars. Wellington is spread over a series of hills. To reach the top of one of the large hills, you can catch a red cable car, which has become an icon in the city. From the cable car and the viewing platform at the top of the hill, you’ll get some amazing views of Wellington, the harbour, and the mountains. Once you’ve reached the upper station in the cable car, you can visit the Cable Car Museum to learn about its history. Beside the cable car station, you can also visit the scenic Wellington Botanic Gardens. Walking through the gardens will take you back down the hill to the city centre. If you are interested in learning more about the history and culture of New Zealand, head to Te Papa Museum. Te Papa is the country’s national museum and houses a number of exhibits that touch on different aspects of New Zealand culture. You can learn about the country’s seismic activity, Maori culture, art, and natural history. In addition to its full-time exhibits, Te Papa always has some rotating exhibits about New Zealand culture. In the past, several of these exhibits have been designed by Wellington’s own Weta Studios–the company behind some of the top movie franchises, including Lord of the Rings. Zealandia is a popular destination to visit in Wellington. It is an ecosanctuary that houses lots of native New Zealand plants and animals. Many of the species who call Zealandia home were placed there because they were endangered. Zealandia has put in huge efforts to preserve these incredible species that can’t be found anywhere else in the world. Zealandia doesn’t enclose its animals, so you will often see a unique bird or small animal walking along beside you on the walking trails. Zealandia is a unique and exciting way to experience the nature of New Zealand.